Bulk Personalized Carabiners, Laser Engraved or Custom Printed, or Blank. Promotional, Inexpensive. 3-1/8" Long. Aluminum carabiners -carabineers, personalized with your custom imprint or blank. Budget Prices in USA and Canada for wholesale custom carabineers. Our wholesale carabiners are equipped with a sturdy Spring Loaded Clip. Free artwork design. We will send you a proof for your approval before production. American clients pay no taxes. Unit prices below include your laser engraving in off-white color, or your 1-color custom imprint on one side of the carabiner. 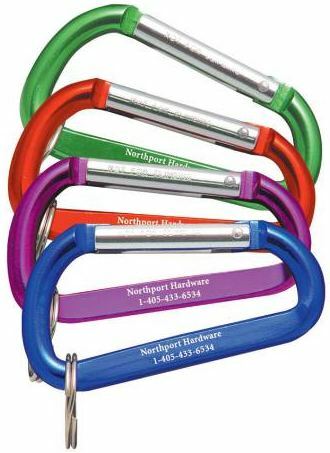 We also supply blank (not imprinted) carabiners at NQP (Next Quantity Price). Setup Charge: $50.00 per side; $30.00 on re-orders. Production Time: 5-7 working days after art approval; blank (not custom imprinted) carabiners ship next day. Product Size: 3-1/8" W x 1-5/8" H; 8 mm (0.31 in.) thick. Imprint Area: 1 3/4" W x 1/4" H (2 line; 16 characters). OPTION: Metal Split Ring : add $0.04 per unit. OPTION: Black Web Strap with Key Ring: add $0.12 per unit. Colors: Black, Metallic Blue, Metallic Red, Orange, Purple, Green. Imprint Method: Pad Printing or Laser Engraving in off-white only. Pad Printing on metal surfaces is not permanent. We recommend Laser Engraving. Packaging: Individual Polybag; 250 pieces/carton of 14 lbs.